Choosing to invest in a sewing machine is a task that is far from easy. If you’ve been in the market to do exactly that, then you’ll agree. There are so many sewing machines to choose from that you could keep searching for ages. Even after searching long and hard, it is difficult to reach a concrete decision. However, if you are looking for a sewing machine specifically meant for sewing and quilting, worry not! This review features a sewing machine that does exactly that. 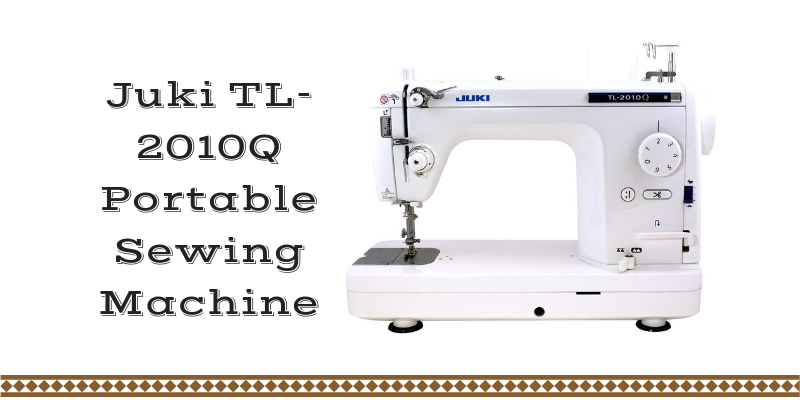 Yes, we’re reviewing the Juki TL-2010Q portable machine! 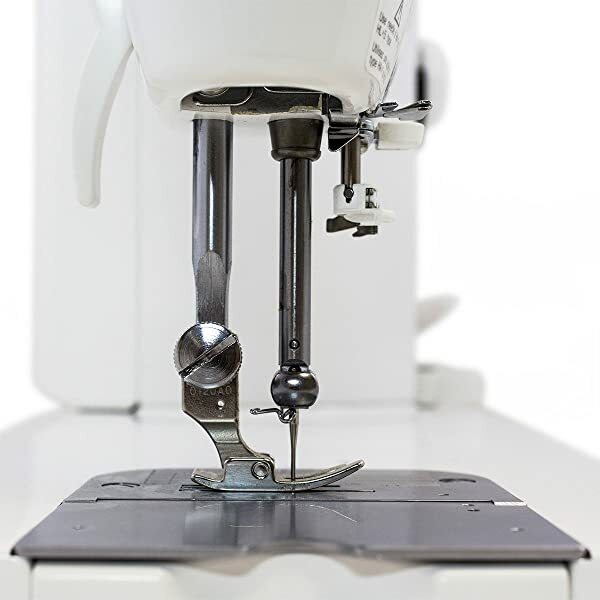 By the time you’re done reading this article, you’ll surely know an excellent portable sewing machine that you can consider purchasing. 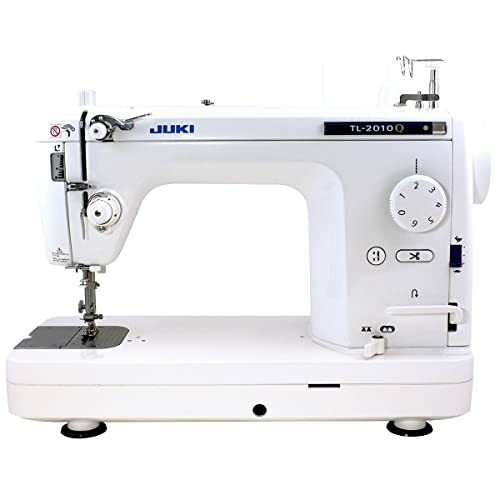 4 What Kinds of Fabrics Can You Sew With The Juki TL2010Q? 8 Is the Juki TL2010Q Worth It? 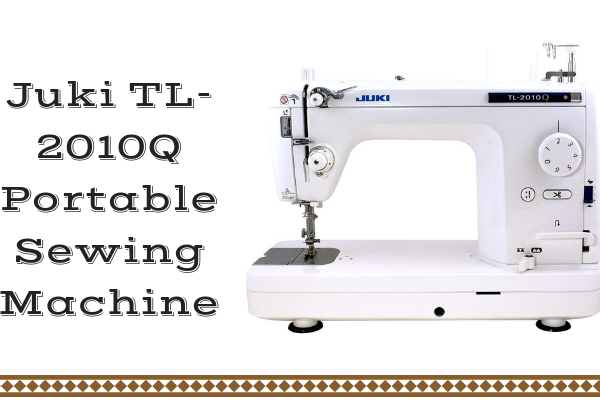 The sewing machine we’re exploring is the Juki TL2010Q. With this model, Juki chooses to go with a minimalistic look. The outside of the machine is white and sturdy. It displays no fancy controls or extra details, providing a clean and simple look. To the left side of the machine, you will find buttons that control the feed dogs and the automatic thread cutter. These buttons have diagrams drawn on them that help to identify the controls. A very creative addition is the buttons that control the speed of the machine. They are depicted with a drawing of a rabbit for fast and a turtle for slow. Measuring a total of 25.7 inches in length and 18 inches in width, the machine is a bit larger than your average sewing machine. These dimensions are not so unnatural considering this machine is a cross between a home sewing machine and an industrial one. A favorable aspect of the design is the great amount of throat space. This makes sure you can observe what you are doing regardless of the size of your project. An extension table. This will surely come in handy for quilting projects. A wide array of presser feet including the 1/4 inch and 1/5-inch quilt foot, an even feed foot, a hemming foot, a zipper attaching foot and compensating foot. A user manual to make your life easy. Although many machines add this function to their sewing machines, it is still a relief that this was included in the design. Of course, you will still be able to raise and lower the needle yourself. The plus point of this certain control is that it can save your time. This feature can be extremely helpful. Should your machine stop out of the blue, this will stop the needle from getting stuck midway. The TL2010Q has a minimum speed of 200 stitches per minute. 1500 stitches per minute is the maximum speed setting. These settings are very rational and easy to mix with. You neither find this way too fast or way too slow. It is great that you find a setting that is perfect for you. What this feature does is that it liberates you from heavily relying on the foot pedal. This is good news for those who cannot work the pedal properly. It is also great for people who cannot sit for a very long period without their leg falling asleep or those who experience back and leg pain. You will find a total of two thread cutting functions in this machine. One option is to use the thread cutter button. This too has a cute little drawing of a scissor, so it is easy to spot. However, if you are really deep into your work and you would not like your concentration to break for even a second, then there is a solution for that too. This solution comes in the form of a built-in thread cutting pedal you can press with your foot. Another nice thing about the thread cutting pedal is that it requires a little force to activate. This way, you don’t have to worry about activating the main foot pedal by accident. This is another fantastic addition that helps you save your time while building up a workflow. However, note that this process is not all that simple. You may have to refer back to the manual the first few times. This isn’t too big of a deal breaker because as you get familiar with the process, you’ll be able to do it in almost no time! A convenient and much-needed feature is the adjustable stitch length. With a maximum of 6mm of stitch length, the machine is good for any kind of project. In fact, it is good for even ones that involve multiple layers of fabrics. From comfortable quilts to projects that use soft leather or even tougher fabrics, the TL2010 can do it all. You only need to make sure that you select the suitable stitch length and you will be good to go. 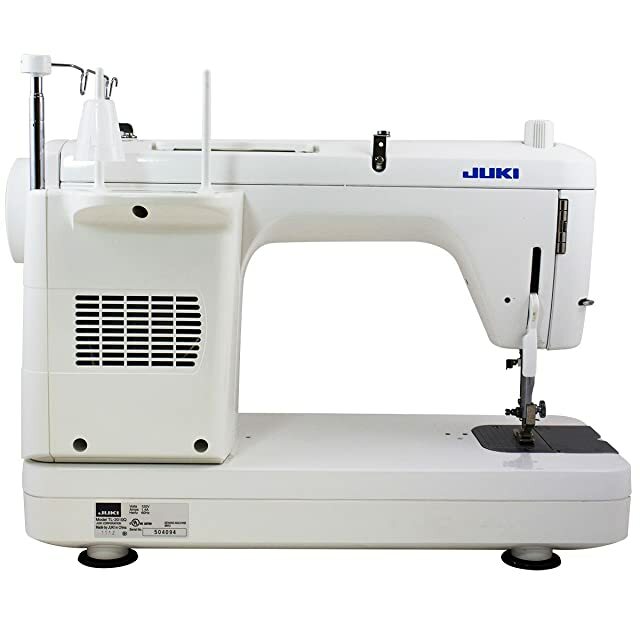 What Kinds of Fabrics Can You Sew With The Juki TL2010Q? This machine can work with virtually any fabric imaginable. Do you want to find out exactly what kinds of fabrics it can sew? Just check out the list below! Fine fabrics like silk, velvet, satin, etc. One look at that list and you will realize that working with this machine sparks up your curiosity. With so many amazing options available, it would only make sense to explore and discover new designs with each project. There are some general features of the machine that are important to mention. The work area can be lit as it is equipped with an LED light. The thread tension and sub tension unit are perfect. Therefore, it enables you to work with even the thickest materials. If you have made it this far, then congratulations! It’s now time to sum up everything good that the machine has to offer. The machine is well built and durable. For that reason it is sure to stay with you for a very long time without giving you much trouble. The working space is definitely a game changer. It helps you get through bigger projects easily without having to worry about not having enough space. This machine can handle heavy duty projects but can also function as a normal sewing machine as well. 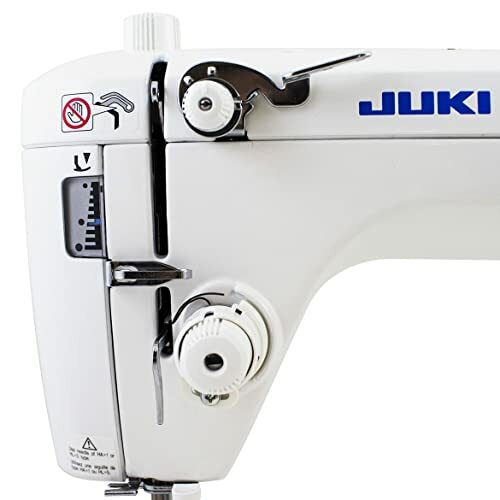 Although it may seem like a simple industrial machine, the settings on the Juki are adjustable. As a result working o projects with this machine is very convenient. The instruction manual makes it user-friendly hence, it makes the machine easier and faster to set up. Although overall the machine is an amazing invention, there are a few downsides. Even though it comes equipped with an LED, the light from it is not all that bright. However, you can easily replace the LED for a better one. Since it is a mechanical machine, it needs to be taken care of quite frequently. It needs to be oiled from time to time to be maintain perfect functioning. However, this is not something that is common in all mechanical sewing machines. The machine is definitely on the pricier side. Therefore, the price may be a con if you’re on a short budget. This machine offers a 5-year manufacturer’s warranty on mechanical defects and a 2-year warranty on electrical defects. It also offers a 90-day warranty for defects in the material. Is the Juki TL2010Q Worth It? This is a million-dollar question. There is no doubt that the Juki is a truly wonderful machine. Only a few can come close to the quality it has to offer. It combines the mechanisms of two machines used for very different purposes. It does have its downsides; however, it is safe to say that the positives easily outweigh the negatives. With the many features and the variety of fabric this machine can work with, this machine is a hard one to pass. 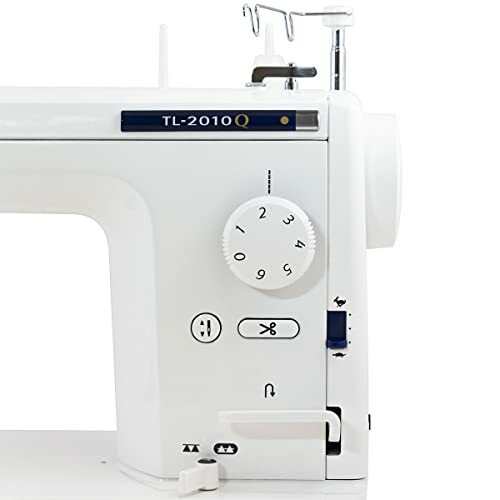 Hence, if you are looking for a machine that quilts as well as sews then the Juki TL2010Q will be a great investment and an amazing machine to work with.